The taste that started it all! Crispy, Buttery and Delicious describe this POPT! favorite. If you like caramel corn this is it! Inspired from an old family recipe passed down to him from his aunt Doris, Mark would give away bags of made-from-scratch caramel corn as gifts to family, friends and a few neighbors along the way. It wasn't long before the news had spread and he began getting requests for his delicious caramel corn for gatherings, birthday parties and other special events. With much support from family and friends Mark and Melanie decided to offer their caramel corn to all, but only if it could be done without sacrificing the original quality and flavor. After several attempts they landed upon success and POPT! 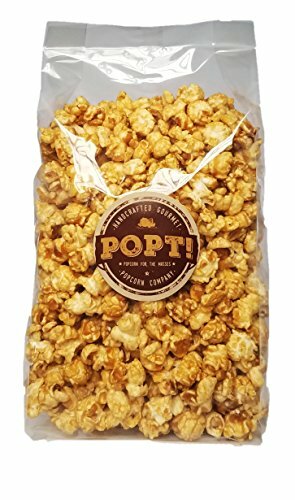 Handcrafted Gourmet Popcorn Company was born. One taste and you'll know why! Amazon Supply Maintained Carefully to Insure Freshness! If you have any questions about this product by POPT!, contact us by completing and submitting the form below. If you are looking for a specif part number, please include it with your message.